Research suggests that the current state of migraine management in EDs is suboptimal. In the journal Headache, Dr. Minen and colleagues reviewed how patients with migraine are managed in the ED. The analysis identified characteristics of patients seeking ED care for migraine and examined guidelines and current practices regarding ED imaging use for migraine. It also explored how current ED care for migraine deviates from recommended treatment practices and investigated potential methods for improving outcomes following ED treatment. Few studies have looked at the makeup of patients that utilize the ED for migraine and why these individuals seek care in the ED. Some research has suggested that migraineurs who use EDs are more likely to be female, older, and non-white. Narcotic use, lower socioeconomic status, and overuse of emergency services have also been linked to ED visits for migraine. In addition, mood disorders may contribute to ED visits for migraine. Imaging practices for migraine in the ED vary widely despite clinical recommendations and guidelines being available to help emergency physicians decide on whether or not to conduct such imaging. Patients presenting to the ED with a recurrence of their baseline headache disorder are not recommended to receive head imaging. It has been hypothesized that if emergency physicians had more time or resources to reassure patients and educate them about their headache diagnosis, the need for imaging may be diminished. Health information exchange may help decrease use of unnecessary diagnostic imaging and increase use of evidence-based guidelines for evaluating headaches in EDs. Many migraine patients report not taking medications—including acetaminophen—before coming to the ED. Most acute migraine treatment recommendations are general in nature and are not specifically aimed at ED settings. Several pharmacologic migraine-specific therapies can be used for managing patients in the ED, but actual practices in the emergency setting differ from current guideline recommendations. More than 20 different medications are commonly used to treat migraine, but triptans—one of the most effective classes of migraine-specific drugs—are rarely used in the ED, according to studies. Furthermore, a large percentage of migraineurs do not receive any pharmacologic treatment at all in the ED. There is currently insufficient evidence to recommend definitive approaches for managing migraine, but Dr. Minen says it is important to develop an algorithm for treating patients in the ED setting. “We need to have an algorithm for migraine like the ones that have been developed for acute coronary syndromes and stroke,” she says. 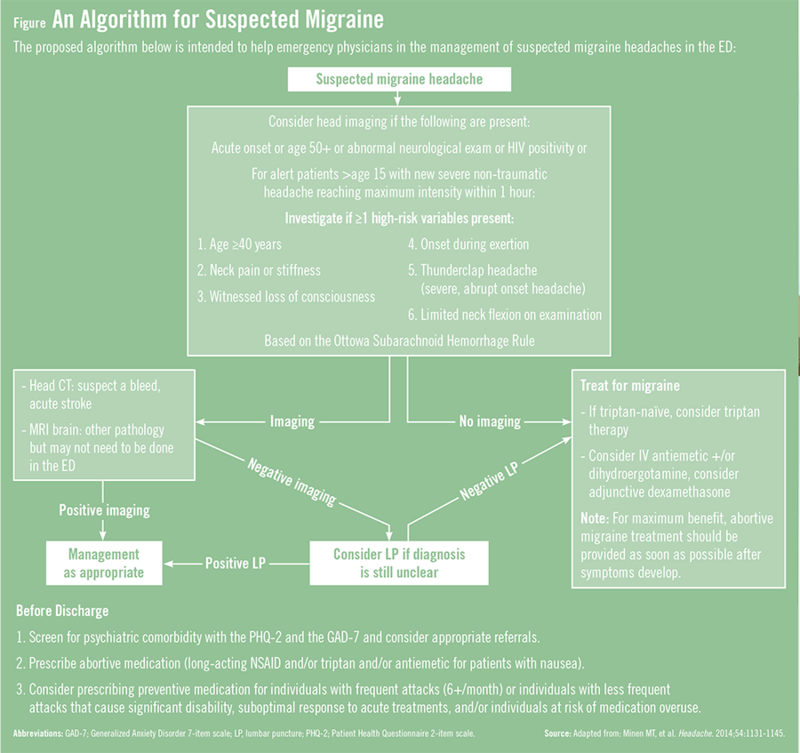 A proposed algorithm (Figure) has been developed to help emergency physicians manage suspected migraine headaches, but more research is needed to determine whether it can improve short- and longer-term outcomes for migraineurs. Minen MT, Tanev K, Friedman BW. Evaluation and treatment of migraine in the emergency department: a review. Headache. 2014;54:1131-1145. Available at: http://www.medscape.com/viewarticle/829593_print or at: http://onlinelibrary.wiley.com/doi/10.1111/head.12399/abstract. Fiesseler FW, Kec R, Mandell M, et al. Do ED patients with migraine headaches meet internationally accepted criteria? Am J Emerg Med. 2002;20:618-623. Gupta MX, Silberstein SD, Young WB, Hopkins M, Lopez BL, Samsa GP. Less is not more: Underutilization of headache medications in a university hospital emergency department. Headache. 2007;47:1125-1133. Gilbert JW, Johnson KM, Larkin GL, Moore CL. Atraumatic headache in US emergency departments: Recent trends in CT/MRI utilisation and factors associated with severe intracranial pathology. Emerg Med J. 2012;29:576-581. Friedman BW, Solorzano C, Esses D, et al. Treating headache recurrence after emergency department discharge:Arandomized controlled trial of naproxen vs sumatriptan. Ann Emerg Med. 2010;56:7-17. Friedman BW, Solorzano C, Norton J, et al. A randomized controlled trial of a comprehensive migraine intervention prior to discharge from an emergency department. Acad Emerg Med. 2012;19:1151-1157. Mia T. Minen, MD, MPH, has indicated to Physician’s Weekly that she has had no financial interests to report.